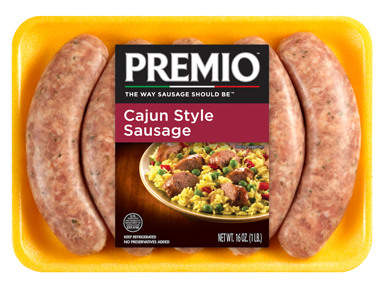 You will feel as though you’ve stepped onto the bayou when you sample one of our Premio Cajun sausages. Hot, spicy and with a taste so authentic you will swear you’re in Louisiana, our sausages can be used in a range of recipes. Enjoy them on a bun for a simple dinner or to liven up a jambalaya. Whatever you choose, you’re in for a treat! Cajun food is known for its delightful bite. The cuisine developed in Acadiana, a region of Louisiana where French Canadians settled centuries ago. Sausage is one of the signature ingredients of Cajun food, along with a trio of vegetables — celery, onion and green pepper. These four ingredients together form the basis for a slew of delectable dishes that rely on boiling, deep frying and smothering for their distinctive taste. Do you have a yearning for Cajun cooking? Then you should bring home Premio Cajun sausage today. Part of our line of special flavors, these sausages have a kick to them that will lift any dish up a notch. We carefully formulated the spices in our Cajun sausages to mimic the ones used by home chefs throughout Louisiana and other areas who have adopted this unique way of cooking. Our Cajun sausages make a perfect addition to any dish, whether you aim for an authentic Cajun recipe or you just want to throw some meat on the grill to start your weekend celebration. Like all of our sausages, our Cajun ones are made with all-natural, fresh ingredients. We refuse to use fillers in our products because we know our customers want good, wholesome food for their families. Young and old alike will clamor for these sausages as a delicious addition to any meal. Planning the menu for a big get-together can be stressful. You may have guests who prefer low-carb food or have to eat gluten-free. What can you prepare that will work for everyone’s tastes? Our Cajun sausages hold the answer. With a scant 2 grams of carbohydrates and a whopping 14 grams of protein, they fit right into any type of low-carb diet. Our sausages are also gluten-free. You can reassure all your health-conscious guests that we make our sausages without MSG and use only natural ingredients, giving you a sausage you can feel good about feeding your family. Making your menu has never been easier. Whether you gather for a family reunion, a tailgate party or a relative’s graduation, you can use our Cajun sausage as the base for a wide variety of dishes. Make an indulgent fettucine dish peppered with sausage. Serve a jambalaya people will request for every family get-together going forward. Whatever you serve, your guests will ask for seconds of our Cajun sausage. When you buy food from Premio, you get sausage you can feel good about feeding your family. Not only do we produce Cajun sausage you can incorporate into a healthy diet, but we run our business with a focus on families like yours. We are committed to quality, customers, our employees and our community, part of our four pillars approach we have embraced throughout our 40-plus-year history. It’s not just the quality of our foods you will appreciate, though. It’s also the other little things Premio Foods does to show we care, such as environmental initiatives aimed at reducing our pollution and greening our packaging. We also help out food banks and worthy causes we believe in. Enjoy Premio Foods — The Way Sausage Should Be.